If you would like to hear about upcoming stuff before it hits my blog, please feel free to join my FAN page HERE, and you are also welcome to join my FB Friends page HERE for everyday stuff!! Great layout Emma. I would loooove to win the Robotz cart. Thanks for such an awesome giveaway. Super cute layout, I love the font, the black and white picture and the stitching! I need to get one of those white pens! What a cute layout! I can't wait to get this cartridge! Hi emma thanks for sharing and chance of winning! Super cute layout. Thank you for such an awesome giveaway. I would love to win. My little boy would be so excited too. What a cute cute layout....love your work! Wow!!! I like those Robots!!!!! all I need is to get a cartridge for myself so I can create little robots too. You ROCK! It's no wonder you have over 50,000 videos. Love the LO, very cute, TFS! hey lil b i love it!! i need to make one for andrew and brandon! Such a cute layout!! The font on that cartridge is great!! That is so cute! I might have to get that cart now. This is such a cute page!! I love it! that is such a cute page. I have never tried to shadow/weld that way. thanks for the video demo! Now I need that cartridge. Awesome! It makes me want that Cartridge even more!! I love your layout! The cart. is so adorable! It would be a nice cart. to add to my collection! Wow! And I love your tutorials and your work.. Take care! Very cute page!! I really like this Cartridge!! Wow, great giveaway Emma! Cute Robot too. I almost grabbed that one for my giveaway, phew glad I didn't! Love the page and the stitching... I have to get that gel pen! Oh, Emma, such a cute layout! I don't have this new cart, but sure woud love to win it!!!! i love this layout! I'm dying to get this cartridge. My boys would go head over heels for it. Congrats!! I love your blog and your videos. That layout is very cute! This cart is definitely on my wish list. My daughter loves the robotz and she is only 2. Thanks for all you do! Cute Layout! I love how your robot turned out. I would love to win this cartridge! TFS. Emma I love your layout it is so cute. At first wasnt sure about the cartridge but now its neat to have. Thanks so much. I really like it. I need a Gypsy but I need to practice on using the Design Studio first before I get a Gypsy. This is so cute! The stitching really sets that picture off. Thanks for the chance to win. Very Cute Layout. I love the ideas you come up with. Hey Emma, wonderful layout. You make it seem so simple!! !....great giveaway. love the layout! Emma, I love following your facebook and blog! You are adorable, and always super sweet with everyone! Love the cart as well, and thanks for giving it away! How cute is that! You inspire me. Thanks for sharing. How cute! I would love to win this cartridge. My son is currently into robots. Love your work Emma, you inspire me. :) Thank you! Too cute Emma! Again great inspiration, I love your work. CONGRATS!!!! Love the Layout. It is so cute and I also like to see how you 'improved' the robot my making it easier to make and it turned out GREAT. very cute layout!!! I really need to get a gypsy! You really inspire me!! Great video. I love the Best Friends part. So Super excited for you, I love your creativity and your 8x8 are just the best. Im so happy that you made it to MPS Designer spot or I would never have found you:) thanks again for your inspiration and the chance for this very FABULOUS cart. The layout came out great!. such a cute layout and cartridge! congrats on hitting over 50,000....thanks so much for your inspiration...hugs! How stinkin cute ! You are one crafty chic !! Oh yay I dont have this cart !! Thanks for a chance to win girlie !! Your layout is so simple but so darn cute. I luv it!! Your such an inspiration to beginners like me. Keep em coming. Thanks for the chance to win! Good luck to everyone!! This is so totally cute Emma! I would love, love, love to win this cartridge! Thank you for the chance to win. Great layout. Would love to win this cartridge. Thanks for the chance. Such a great cute layout! I think this would be great to use for my boys. Thanks for the chance! i dind't think i would use this cartridge much wheni first heard about it but i went onmy gypsy and looked at it and it is sooo cute. i would love to win it thanks so much for the chance to win it. Super cute. You inspire me to be more creative with my gypsy. Love watching your videos. I love this layout...it makes me really want this cartridge. My son would love a bunch of robot pages for his album! my wife would love this cartridge she is always checking your blog. Oh, wow, my little man would love this cartridge and so would I. I love this layout and thank you for showing how to weld the title. I really just LOVE, LOVE, LOVE to watch your video's you are so talented! Thanks Emma for sharing all your talent with us. Very cute layout!!! Thank you for great info with the gypsy. I just bought one last week and you have been great help. Thanks Emma, You are one talented lady thanks for sharing it with us. Such a cute layout- simple and easy! Great job Emma! Love the layout! I don't have little boys in my life, but this would still be a fun cart to have! Thanks for another great video! Hi Emma. What a cutie patootie page you made! The boys are so adorable with the big sunglasses on. Congratulations on reaching over 57,000 hits, and for having over 421 followers on your site. This is just the beginning, because your site is always brings such joy to those who see it. Thank you for doing so much for all of us. Thanks too for the chance to win the Robotz cart. I hope your eye is better now ... is it? How could anyone NOT just love that! Way to cute! Hi Emma!!! You are soooooooo sweet for giving this away!!! I was just leaving you a comment on YouTube about how much I want this cart cause I have 2 boys and then you made the announcement and I gasped!!! LOL....fingers crossed!!! CONGRATS on all your success....you go girl!!! Very Cute Layout!!! You have such great ideas. Thanks for sharing all of your ideas and creations. SUCH a CUTE layout!! Thanks so much for the chance to win this adorable Robotz cartridge! Love watching your videos to see what new projects you have created. Would love this cartridge to scrapbook for my grandson. Love it, great job!! I would LOVE to win this, I didn't think I needed it until now! The font is worth it!!! Love the layout, so cute! I love your blog and all of your videos! congrats emma! its nearing 60000 hits real fast! thank you for your great videos and ideas! Love those colors!! Thx for all you do, Emma!! So cute ! So glad I found your blog ! Gee Emma i hope random org picks me, this cart is on my WANT list. Your LO is way to cute. Thanks for the video, i look foward to watching every one that you make. What a cute cartridge! I like that it is simple and easy to do..
wow, great page Emma. You are so creative, you put me to shame. You are so sweet to give this away!! I love your blog and am so glad I found it and became a follower! i so love this cart. cute card thanks for sharing. What an awesome opportunity! :) Great project too, but I already said that on Youtube! *LOL* If you click my profile here you should be able to contact me via e-mail or my blog. You make everything look so easy. Love this page! Love your videos!! I loved your video and thank you so much for the giveaway!! I can't wait to get this cart to play with even if I'm not picked I will still buy this one!! Great Page. Very Cute! Love it. Thank you for the chance to win this cute cute cart. I love your layout. Too cute! PS I love this cart!!!!! Love the page. Really cute. Very cute layout. Thanks for the chance to win. 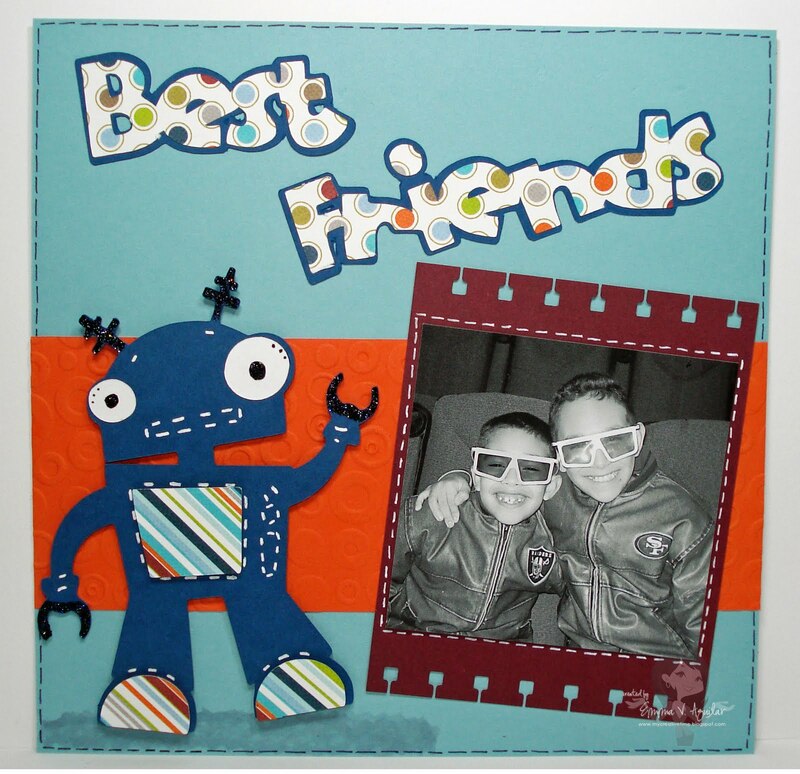 I love the paper that you used for "Best Friends"! Thanks for sharing your ideas! relly nice Emma. I really your work. You're boys are so cute too. I can see that you're a proud mama. I don't have that cart yet, but will look into it. I just that cartridge I want it also I know I want tham all. I love the paper you used for the best friends. the whole page is just to cute. I Loved your layout, it is so cute. What a cute page. This cart would be great for my sons scrapbook. Hope I win! What a super cute layout. I so enjoy your blog. TFS. The video was great. Congratulations on all your wonderful success! Very CUTE layout! Thanks for a great opportunity! I love this robot cartridge, this layout is adorable. ADORABLE page Emma.....I just love it...you are totally awesome. Ooooooooooooooh I love it! Great boy LO!!! What a cute layout! I am new to your blog and I am really enjoying your creations! I LOVE the layout, I so have to get the Robotz cart, it is soooo cute!! Perfect for my 14 month old. That is so wonderful Emma.....Congrats!!! Thank you for sharing with all of us!! Have a blessed weekend. Thank you for the chance! Great Video! I just love your style! Keep it up! Your layout is so adorable! Excited about this new robot cartridge! ! Very cute page Emma. That Robots cartridge is pretty fun, I would certainly love to win it. OH and I just love the cartoon of you on your page. Cute layout! I got my gypsy about an hour ago. It's charging as we "speak!" Thanks to you, I'm not quite as scared to use it. what a cute page you've done! Thanks for sharing. I too love this cart, it is so boy. Thank You Emma for all your helpful videos. The Robots cart looks so cute...hope I am lucky...I would love to have one. OOO!! Would sooo love to win this....I have 2 boys who would flip....thanks for the chance.. Thank you for the great work you do and for sharing it with all of us. I love your gypsy demo's. Thank you for being so helpful with answering all of our questions too. Wow Emma! Congratulations! I love your blog and look forward to your videos! It is easy to see why you have so many hits and followers! I love this layout and this cartridge is just too darned cute! I love the font and the way you rocked the letters! Thanks for a chance to win this great cartridge is on my must have list! Cheers, to continued success! Would love to have this cartridge. Perfect for little boys which I have quite a few of in my life. Super cute layout! Hi Emma!!! Your 2 boys are just to cute and they have an awesome mom that made this cool LO for them. Hugs, Martha C.
Emma, that is such a cute LO. Thanks for sharing how you make a shadow for your font it is somewhat similar to how I do it. I wish they had a shortcut for that :). Anyway, this was another fabulous video and project. Thanks for a chance at winning Robotz! Love the Robotz cart.! I really enjoy the creative posts you share with us - Thank you! What a cute layout!!! What a way to end tax day!!! lol Thanks for the giveaway! What a cute layout! I may have to buy another cartridge :) Thanks for sharing and inspiring. What a fabulous cartridge, I love the Robotz. The videos are so helpfull. Your blog is another one on my inspiration list. Your work is awesome and your videos are sooo helpful! This cart is so perfect for little boys! Luv it as always!!! U r 1 talented lady!! The Boys are adorable, luv their smiles!! Congrats and what a cute layout - love that cart too. Such a cute layout for such a cute picture. You are such a inspiration.. I just love all your great ideas. Great layout and great picture. Neat to see the Niner and Raider jackets being that I am originally from the Bay Area. Adorable layout, I really love how the stitching adds to the Wow factor. I would love this cartridge. My two nephews do Robotics competitons. Great picture of your boys!! Very cute layout. Love the robotz cart. Hope I win! Cute layout, love the robot and would love a chance to win. Love the layout, the robotz are perfect for boys and I guess a few girls lol. What a cute pair of boys you have too. Really cute page Emma. Your little ones are so sweet! I love the detailing with the white pen on the robot. Really makes him stand out! Thanks for the great opportunity to win! Nice touch with the stickles! Very cute! Love your blog! It's one of my favorites! I also share in your love of polkadots! Thanks so much for this opportunity! Super cute LO. Love your videos. Thanks for sharing all your great ideas. Super cute. So glad I found your blog. Thanks again. This cartridge is so cute and your page makes it even cuter! I am now doing 8X8 pages due to the # of small school pictures I receive. Previously, they sat in a drawer. Thanks for the opportunity to win this cartridge. You rock! How cute is this? I would love to win. My nephew is the robot king and I could do a whole album!!! Keep up the great work. Debbie e.
Wow Girl, you have become really popular! I guess this should show you just how much we appreciate your talent! And the Robotz are so cute. I'd love to own it, because I have lots of guys to scrap and make cards for! Even though my 'little' guys are all grown up, they'd still love these 'bots. Thanks for all you do! Love your layout.. Would love to own this cart to scrap for my little one. I love your layout - so simple it looks spectacular. Thank you for the chance to win. I do have to say when I was watching your video my 3 yr old was watching with me and she started talking in her robot voice! Great video! Love the layout! Thank you so much for the chance to win. That looks like such a great cart! Congrats Emma! Well deserved! Love your blog and your videos have been helpful. Great page! I too like the 8x8 size! Thanks for the chance to win a cute cartridge! Keep up the great work and I look forward to more of your creativity! Emma, I love watching your videos and seeing all your wonderful creations. You are such an inspiration! Thank you for the giveaway. Congrats on you 50K hits (it has to smart just a little)! You do the most amazing things with the Robotz cart... I'd love to have it for cards and layouts! Very cute layout! I would love to have this cartidge, thanks so much for a great giveaway! Love your videos! Thanks for the opportunity to win this cartridge. I have 3 children that will love it. What a super cute layout! I can't wait to get this cartridge, my boys love Robots. although I think most little boys do. have a great day. Great Layout - thanks so much for the giveaway!!! That is one cute page Emma. I love everything you make. Congrats on your blog and FB fan page. I love your blog. I am seriously thinking about purchasing a gypsy after watching your videos.